For many IP phones or adaptors, your Mac and telephone device must be able to find each other at a known IP address. Many LANs are configured using DHCP which means devices may be assigned IP addresses on a first come first served basis. Your configuration will be more stable if the local IP address of your VoIP phone or adaptor and the host computer running Phone Amego do not change. Many DHCP servers provide a mechanism to assign a static or fixed IP address to a specific device which you can use. 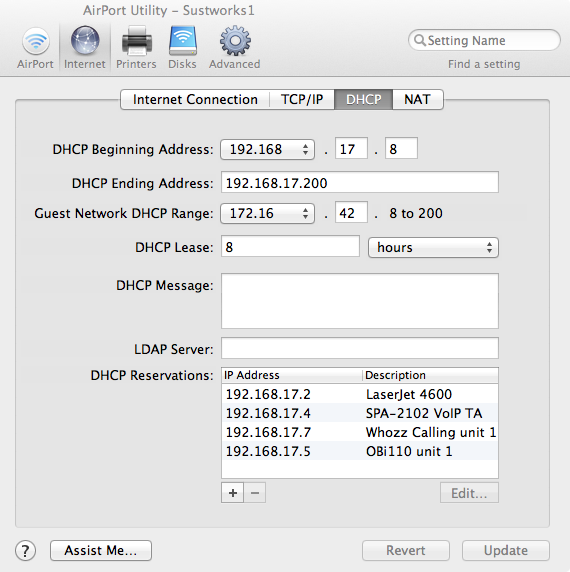 If you have an AirPort Base Station for example, launch the "AirPort Utility", press "Manual Setup", and navigate to "Internet -> DHCP". I use a "DHCP Beginning Address" of .8 to leave a few fixed addresses for other devices. In the "DHCP Reservations" section below I then list the fixed IP addresses I have assigned along with their descriptions. Even if you cannot configure a static IP address, your VoIP phone or adaptor will normally be left on all the time (24 x 7), so the DHCP lease should be renewed (keeping the same IP address) before it expires. In the event of a power disruption, DHCP Servers are designed to remember your previous IP address assignment and give it back to you unless it's not available. Finally, Phone Amego can scan the first 255 addresses of the assigned IP subnet to look for your adaptor and fill in the IP address automatically. If you notice your VoIP device is no longer "connected and ready", simply press the Attach Device button and Phone Amego will try to find it. To force Phone Amego to rescan for your device, delete the previous IP address (if any) and press Scan.